If your question is not listed please visit the Contact page to submit your question. When most people think of charities, they envision a group of people interested in making a difference in a particular aspect of people’s lives. Any community, no matter how large or small, has many different needs that various charities can address. In order to foster the sense of community in charitable giving, charities known as community foundations have come into being. As the non-profit equivalent of locally based businesses, community foundations can give donors the flexibility to pinpoint their philanthropic efforts on whatever needs their community may have over time. What are the advantages of a community foundation over other charities? There are a number of ways in which community foundations can achieve results that typical charities cannot. Community foundations generally provide a one-stop shop for donors who want their gifts to have an impact throughout their communities; a donor can make arrangements with a community foundation that leave the donor flexibility in the timing and distribution of gifts to particular target charities. Also, while smaller charities may be unfamiliar or uncomfortable with taking certain types of unusual assets as donations, such as appreciated stock, real estate, collectibles, and other property that is difficult to liquidate, community foundations have the experience and contacts to help donors and charities unlock the value of unusual gifts. Also, by providing a clearinghouse for donations, community foundations can gather contributions from multiple donors and put them together into a single fund, creating a more substantial effect on the community. By coordinating grants, matching funds and other resources, community foundations can tap into every available source of funding for a given cause. Once a community foundation reaches a critical mass of funding and has a positive reputation within the community, everyone and every organization have the potential to benefit from the foundation’s growth. Essentially, a growing foundation ensures that groups waste none of their limited resourced duplicating each other’s tasks. Finally, by keeping current on the tax laws that confer many benefits on charitable donors, community foundations can provide valuable assistance with planned giving and complex charitable planning. It is also important to note that ……contributions are tax deductible. Donors have a wide range of interests and many different goals. The Wayne County Community Foundation has a selection of already established funds. Typically they fall within four categories of interest: Humanitarian, Educational, Environmental and Cultural. However, donors may establish a new fund with their own interests tailored to their fund development and target focus. Funds in the Foundation are “pooled” and managed by investment professionals with one of our local institutions: The Wayne Bank; The Honesdale National Bank; The Dime Bank; Citigroup, Smith Barney. Why give to a community foundation instead of establishing my own private foundation? There are significant tax advantages to setting up a support organization or donor advised fund at a community foundation. Also, the administrative burden of the daily operations of running a private foundation is eliminated and the federal requirement of 5% annual distribution. What types of charities receive grants? Grants awarded through specific funds at the Wayne County Community Foundation must be made to non- profit organizations. For grants from unrestricted funds, our areas of interest generally fall within the following: humanitarian, environmental, educational, and cultural interest. With donor designated funds, your choice or cause can be that which you choose. How does a nonprofit organization apply for a grant? Our grant guidelines and applications are available on this site in the For grant seekers section. We request that you first follow these directions. What is the minimum contribution needed to start a fund? While there is no minimum amount needed to start a fund, we require that you defer making any disbursements until the fund reaches $10,000….this is critical if we want to create a fund that lives in perpetuity. Typically, once a fund reaches this threshold, an annual grant of $500 would preserve the principal in perpetuity. This said however, you may give less until your fund reaches this amount. In that case it will be added to the General Fund where we’ll invest it with other funds, and make unrestricted grants from the interest that this fund earns. When your giving reaches $10,000 and you still wish to create a separate fund, we will transfer your previous contributions to the fund you want to establish. Can I pass the right to make grant recommendations down to my children or other members of my family? Absolutely! When you begin a fund, you can name an unlimited number of successor advisors. Specifically, what are the various types of funds? 1. Unrestricted Funds offer the broadest giving option, allowing grants to be made wherever our board determines our community’s needs are greatest. 2. Field-of-Interest Funds create grants that meet needs in a particular field or geographic area that is of interest to you. 3. Donor-Advised Funds enable you to recommend specific organizations to receive grants. 4. Scholarship Funds help students pursue academic goals. You may define guidelines for candidacy, the advisory committee, the school and the award itself. 5. Designated Funds let you support specific organizations while we make sure that grants to these groups remain relevant over time and responsive to changing circumstances. 6. Organizational Endowment Funds are established by nonprofit organizations to provide income to them. We handle all administrative and investment responsibilities, freeing the organization to pursue its charitable mission. 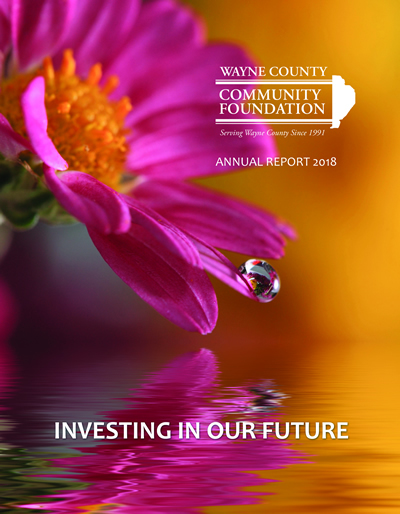 Why Choose the Wayne County Community Foundation? 1. We know Wayne County, its organization, its needs, its potential. Our Board members represent all corners of the county. 2. We help you achieve superior tax benefits. 3. We make set-up and administration easy. 4. We share your interests…we are here to help you become connected to the issues you care about most – and we will respect that! 5. We care about the future. By setting up a fund, you have the ideal opportunity to create a legacy for yourself and for our county.